Her newly released, third full-length album is titled Someday, Someday, but if Sarah Sample is referencing her music career, I’d say the day has already arrived. Press play and Sarah’s sweet voice washes over you, sometimes feather-light, sometimes smoldering. The rocking, anthemic, I’m Ready will have you excited to take on the day by the time you hit the the first chorus. Next, Calling Your Name will reach inside your chest and set it throbbing in sympathy, until the haunting cello line comes to the rescue as a soothing balm to the heartache. Near the end of the album, the jaunty love song to a loved one left behind while on an overseas Holiday has a touch of the 40’s era, but with ukulele and glockenspiel keeping it peppy and sweet. That just gives you a brief idea of the range Sarah can cover. Knowing that she’s been a finalist in just about any folk songwriting contest you can name should give you even further evidence to her talents. They won her a performing slot on 2010’s Cayamo Cruise and one on the mainstage at Rocky Mountain Folks Fest, where I first met her in 2008. Seeing and hearing is believing though, so check out this lovely little video for Calling Your Name that was done on a studio break this summer in Provo, UT. The band is comprised of Ryan Tanner, Paul Jacobsen, Mai Bloomfield, Dylan Schorer, Ryan Tilby, a good many if not all of those folks are talented songwriters themselves! If you are viewing this post elsewhere you may need to come to the actual blog to see the videos. 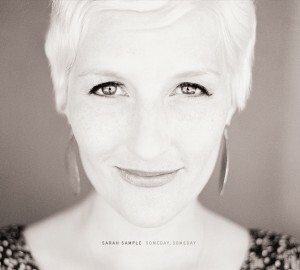 Find out more about Sarah on her website: http://www.sarahsample.com/ From there you can buy her music and connect to her on Facebook, Twitter and YouTube. Sarah will bring her energetic, sincere and magnetic folk-rock to Cafe Paradiso on Saturday, Oct. 23rd. Tickets are available at the counter now, make sure you get one! Get to know Sarah a little before her concert by tuning in to the Lyrical Venus Radio Hour from 9-10am Central this Tuesday, Oct. 19th. Music by amazing women for the first half, Sarah will be calling at about 9:30.